Like lake, river, and sea ice, permafrost forms due to subzero surface temperatures that induce freezing from above. Surface tension effects retain some liquid water content to low temperatures (-10°C or less), particularly in fine sediments such as clays and silts. However, the 0°c isotherm in the ground generally represents the freezing front: the depth at which the phase change begins and ice can be found in the soil or rock matrix. Seasonal ground frost is widespread in midlatitudes and high latitudes, penetrating to a depth of a few decimeters. Where temperatures are warm enough, this frost recedes each spring or summer. 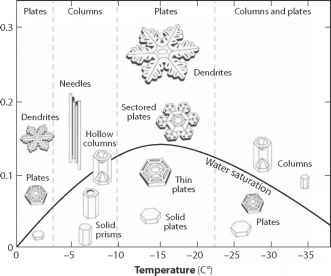 In places where the mean annual surface temperature is below 0°c and seasonal frost survives the summer thaw, the freezing front in the ground propagates to depth through thermal diffusion. Note: k, c, and k are the thermal conductivity, specific heat capacity, and thermal diffusivity, respectively, and q is the liquid water content. be quite well described through one-dimensional (1D) thermal diffusion in many settings. Other influences on the energy balance such as heat advection from water transport and the warming effects of water bodies (lakes, marine environments) can be locally important in causing lateral variability in permafrost thickness. Thawed ground adjacent to a river or lake is known as a talik. The hydraulic permeability of frozen ground is low, so movement of water usually occurs in unfrozen ground beside and below the permafrost or in fractures that can be produced by thermal contraction or desiccation of the ground. Growth of permafrost occurs through freezing of interstitial water at the freezing front. Low capillary and vapor pressures can lead to migration of water and water vapor to the freezing front, and this promotes the growth of massive ice: ice lenses that are millimeters to decimeters thick. These produce frost heave and unusually high ground ice content, so upon melting they lead to large-scale ground subsidence. The geologic material plays a large role in the response time and depth of permafrost, mostly through controls on the liquid water content. Table 7.1 lists the thermal properties of some common soils and rocks in permafrost terrain. Porous, saturated materials with high water content have a high effective heat capacity, due to the latent energy associated with the advance or retreat of the freezing front. Crystalline rock is at the other end of the spectrum, with high thermal conductivity and a minimal amount of free water in cracks and fractures. (conductivity, heat capacity) can be calculated accordingly, although it is common and physically better justified to calculate the bulk thermal conductivity through a harmonic weighted average. The equation governing 1D thermal diffusion in the ground is then of the same form as (3.5), but using bulk thermal properties, with upper surface temperature prescribed as a boundary condition. A second equation is needed to model the movement of the freezing front. Similar to the growth of sea or lake ice, this is described by the rate of freezing or thawing at the front, m, following where Qin and Qout represent the heat flux into and away from the freezing front (W m-2), modeled through heat conduction in the unfrozen ground below and frozen ground above (subscripts u and f, respectively). The vertical position of the freezing front is defined to be z = f, with the minus and plus signs denoting the temperature gradients (hence, heat fluxes) below and above this front. Where m is positive, there is melting at the front and permafrost thinning. Where m is negative, there is permafrost aggradation. Qin can be estimated from the local geother-mal heat flux or heat flow in the unfrozen ground underlying the permafrost can also be modeled explicitly, as per (7.1). If appropriate, an advection term accounting for heat transport from water can also be added to (7.1) and (7.2). Numerical solution of (7.1) and (7.2) is straightforward. A moving grid is recommended to follow the migration of the freezing front, as used in the example of lake ice growth in chapter 4. One common assumption is to assume a thermal steady state in (7.1), which is equivalent to a linear temperature profile in the permafrost; given the upper surface temperature, geothermal heat flux, thermal conductivity of the frozen ground, and the fact that the lower permafrost boundary will be at the pressure melting point, the temperature gradient in the permafrost is then uniquely defined, and permafrost depth can be calculated. This is reasonable for first-order approximations of permafrost thickness, but it cannot account for transient climate effects during permafrost growth and decay. Here, the second term on the left-hand side represents the latent energy required to melt or freeze free water as temperature changes in the soil. When 9w = 0 (i.e., at sufficiently cold temperatures, or below 0°C for some geologic materials that support a sharp phase transition), this expression collapses to (7.1). The advantage of (7.3) is that there is no need to track explicitly the freezing front via (7.2); this is implicit in 0w(z), and one can define the permafrost thickness purely from the condition T < 0°C in the modeled temperature profile. However, (7.3) requires knowledge of the soil water content and its behavior with temperature, which are difficult to measure and simulate. The methods for modeling subsurface temperature and phase-front evolution are reasonably well established, but it can be surprisingly challenging to predict surface temperature forcing for permafrost. Mean annual surface temperature is not the same as the mean annual near-surface air temperature, which is what is usually measured at meteorological stations. Vegetation cover and snow depth are the greatest influences on this. Both have an insulating effect that gives mean annual surface (ground) temperatures several degrees Celsius above the mean annual air temperature in most situations. There can be exceptions to this. For instance, extremely thin snow covers (e.g., less than 10 cm) do not offer effective insulation. Snow cover that persists into the summer can also cause cooling of the ground relative to mean annual air temperature, as a result of snow-albedo effects and the high thermal emissivity of snow.